This post card was posted in Rugeley in October 1905. This hunting scene (note lady riding sidesaddle) has part of a station in the background. Could this be Rugeley Town? Looking at Google Earth, it does not really seem to correspond with Rugeley Town. There seems to be a road parallel to the railway (which swings left and the railway soon crosses) between the station and the parade ground. I've only had a quick look but I don�t believe it's at Rugeley. Certainly not Trent Valley and I can�t think of anywhere near by to Town where there is a bridge like that. I don't think it's either. Town is high up, at the end of a substantial viaduct. Trent Valley has quite a steep access road; it was a zig-zag until the station was rebuilt, and the configuration of road & approach is wrong. I think it's Armitage. The layout of public road, under-bridge and approach road fits. It would be the up side, with the goods yard further towards Stafford, off the photo to the right. Note the pre-1883 type signal, with spectacle low down the post. This may have survived until the Armitage to Rugeley quadrupling of 1912/13. Any other ideas on the date of the photo - I guess hunting dress changed little over the decades? Armitage looks a good thought and certainly seems to match the 1902/3 1:2500 map. The date of the picture is almost certainly November 1904 or the next few months as there are no leaves on the trees. The style of the card suggests 1904/5 and such events were usually photographed and prints made available within a few hours. Posted October 7th it could not be the 1905 hunting season. It's at Armitage Station on the Trent Valley Line. 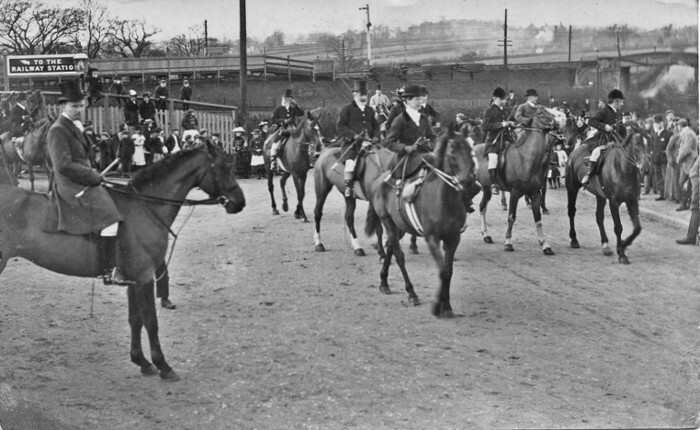 After checking with the local historical society, the Hunt is probably the South Staffordshire and it is standing on the approach to the station which is off to the left, the north end of the up timber platform being visible behind the horses. The signal was erected in 1877 to protect the new junction into the Armitage Goods facility and controlled from a new signal box built to control the main line connections to the goods yard. The goods yard junction, the new signalling and the new signal box were inspected by Col. Yolland on May 24th 1877 who reported that the signal box had 20 levers of which 15 were in use at the time of his inspection. What is of interest, is that many commentators have stated the goods facility was opened some four months later on October 1st - but so far we have not been able to find evidence to corroborate this and if anyone has verifiable evidence, we would love to see it. But what is of real interest is the bridge over the road on the extreme right of the picture. The road was the old Turnpike, now the A513, and the bridge is the first picture we have seen of one of Thomas Gooch's compound trussed girder jobs - cast-iron plates with laminated supporting tensioning rods. Gooch was the chief civil engineer for the building of the line and he based his design on Robert Stephenson's bridge over the River Dee, which collapsed a few weeks before the Trent Valley line was due to open. Thankfully, Gooch did not follow Stephenson's design religiously, but based his bridges on the same principles - in modern parlance, he upgraded and beefed up the design. When the Dee bridge collapsed, Gooch stated his bridges were strong enough but he recommended they be strengthened anyway and no doubt gave himself and the LNWR much peace of mind! The bridges were tested by Stephenson, accompanied by the B-o-T inspector. There were TVR six bridges of this design, the largest being the three-span viaduct over the River Tame at Comberford which was strengthened with extra supporting piles driven into the river bed, the other bridges had additional cast-iron girders fitted. We had no idea about the exact design but with a doodle found on a letter to the LNWR from the Office of Commissioners of Railways, a through, lengthy examination of Stephenson's Dee bridge design, and the services of a professional structural engineer, we had established much of the design, but this picture provided the final piece of the jigsaw, namely Gooch's use of laminated wrought-iron strengthening rods in the same way as the Dee bridge. One of these can be seen as the angled feature from the bridge deck up to the supporting masonry and if the famous etching of Stephenson's collapsed bridge is studied, the tensioning rods to the same pattern can be seen. In Stephenson's bridge the way the tensioning rods were used rendered them useless - as described by the accident inspector and corroborated by our structural engineer. Gooch's tensioning rods worked properly. And he got it right! This picture establishes his bridges appeared to have lasted at least 50 years assuming the postcard picture, posted in 1904, was taken near to that date. We don't yet know when the bridges were replaced by more modern steel structures, but the Arnitage bridge (No. 112) was again replaced by a 400 ton steel structure in 2007 as part of the widening to Tamworth. The dates in the description Dave and I sent you in March as to when the photograph was taken can be refined. We have just unearthed evidence that Armitage Station was completely rebuilt in 1892 and the rebuilding included lenghtening the platforms at their north ends and the extended up platform can be seen in the picture. Therefore we can confidently conclude the picture was taken between 1892 and 1904 (the posting date on the postcard).